Alex Rothwell, SHP community relations specialist, speaking at WSPA’s annual conference. 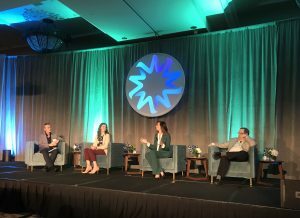 SHP’s community relations specialist, Alex Rothwell, was a panelist at Western States Petroleum Association’s annual conference. She participated in a discussion on “Why Millennials Matter”. As a millennial, Alex was valuable in giving insight on her perspective on this topic. She provided advice to oil and gas industry executives and associates on how to better understand and engage the millennial generation in the work force. She also shared ideas on how the industry can better reach millennials through messaging and branding. The other panelists included Morley Winograd, (author, speaker and millennial guru), Libby Hall (Director of Client Services & Social Media Expert at Unearth) and the panel’s moderator Simon Mainwaring (Founder and CEO of We First). Alex has been a community relations specialist for Signal Hill Petroleum since November 2016. As the company’s community liaison, Alex is committed to fostering an open rapport and mutual support between SHP and its neighbors. In addition to community relations, Alex manages SHP’s commercial and residential properties throughout Long Beach, Signal Hill, and Newport Beach. She is also responsible for managing SHP’s marketing material, media inquiries, presentations and tours. 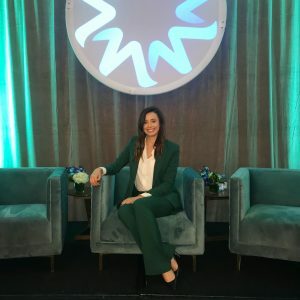 While earning her BA in Communications, with an emphasis in Public Relations from California State University, Fullerton, she interned for SHP which led her to a job offer once she graduated. She is currently on the Board of Directors for the Signal Hill Chamber of Commerce and a member of The Young Professionals at the Petroleum Club.